I am particularly proud of this guy being the very 1st crochet pattern I made myself. We have an Aunt in the family who likes the Happy Face and we call her our "Happy Face Aunty", so of course when I was to make her something I knew just what it had to be! After a long search for a pattern I couldn't find one I liked. Out of desperation I made up this guy and thankfully he turned out great. 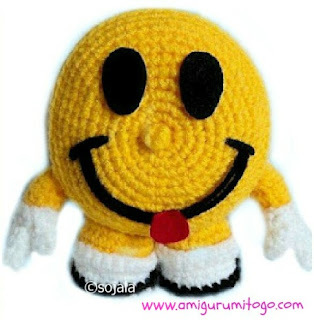 Have fun making your Smiley Face! 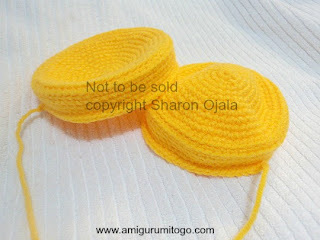 Special notes: I worked in continuous rounds with a 3.75mm hook and worsted weight yarn. He is about 6 inches tall. Have any questions or if you come across a mistake in the pattern please leave a message in the comment section below. You will fit the 2nd piece you make into the 1st as pictured below. Before sewing the 2nd to the 1st make a nose by creating a knot or chain 4 or 5 and sew into the middle of the magic circle you started out with. If you make a 2 sided Happy Face as I did then make 2 noses. 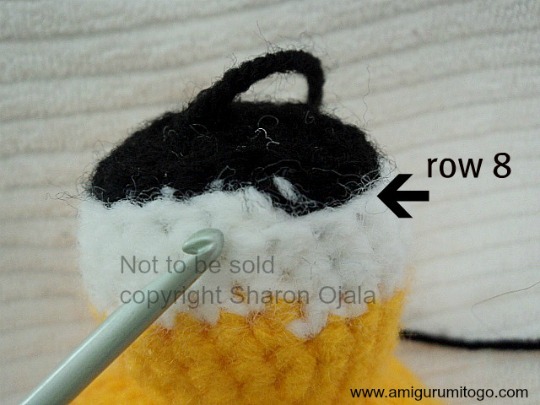 10) crochet 2tog around in the BLO until you close up the hole, * remember to stuff the leg before closing! Now for the top part of sock, with white, chain 24 and 1sc in each across starting with 2nd chain from the hook. Finish off and sew onto top part of sock as pictured. 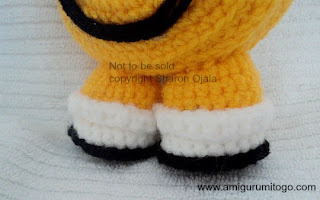 For the black edge around bottom of shoe, insert black and 1sc in each around the front loops of row 8. Slip stitch the last stitch and finish off. 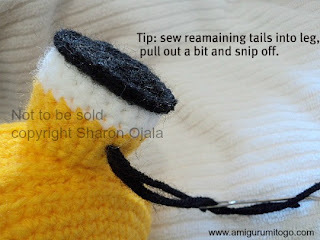 Sew the remaining yarn tails into the leg. 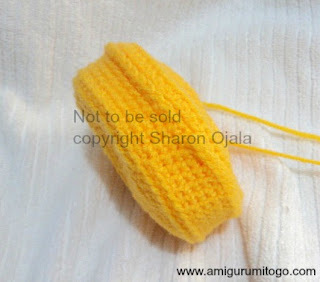 3-4) Fold the top part of arm in half to determine which is the top half of the arm and which is the bottom part. 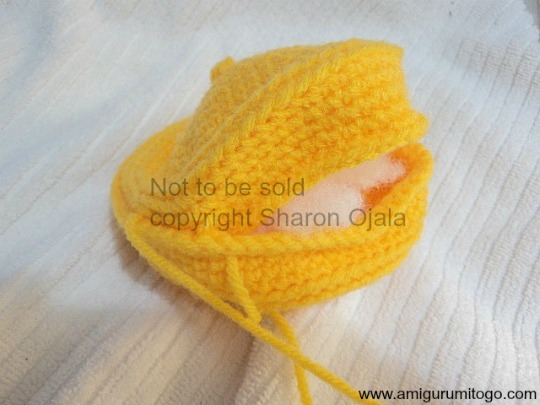 And in the BLO 1sc for 6 stitches of the top half. And in the FLO 1sc in each of the next 6 stitches. Do this for 2 rows. Doing the top part of the arm this way helps the arm to hang down and not straight out. 14) 2tog until you close the gap *** remember to stuff before closing! For the eyes, I cut pieces of felt and glued them in place and the smile I sewed in with a length of yarn. My hope is that you have enjoyed this pattern. You may sell finished products. Do not reprint this pattern. If you'd like to share this pattern please link back to it. Thank you for posting Smiley Happy Face. Hi Kathy, the eyes I cut from felt and hot glued them in place. 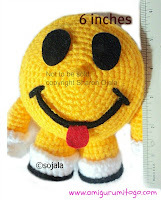 And the smile is made by a length of yarn if you watch this video I show how to sew in the smile. Kathy, you can also highlight, right click on the blue and click on "open link"
How far do you seperate the legs from each other? Hi Jackie, I never measured how far but if you take a look at the prt 2 of the video tutorial you can see where I put one leg then started the other... hope that helps! God bless and thank you for any help you can give me. I'm looking forward to finishing this. Hi Marlicia, I'm so glad! I was just going to link you to the video because I wasn't sure what you meant but now all is good, whew! Das ist ja ein obersüßer Smilie geworden!!! Vielen lieben Dank für die Anleitungen, ich habe schon einiges gezaubert. This is such cute pattern. I have no idea how you made this up on your own. You are very talented. This Pattern is ubber cute! !